We had some pretty impressive rain totals. Main areas of the Sierra crest picked up 6-10 feet of snow at the very highest elevations. Some areas saw nearly 10 inches of liquid precip over the course of the last week. All of that was much needed. However things are going to dry out for a while. The ground moisture content is very high, so expect some fog for the next few days. Also expect a big warm up. The nearest I can see in the way of a storm cylce appears to be about 10-14 days which brings almost no confidence with it. I will continue to search for storms and give you, my loyal readers, the advanced notice. The last storm in our series of storms is getting more impressive by the hour. In addition, snow levels should be around 5,000 to 6,000 feet max. The storm will crank up Sunday afternoon and last through at least Monday morning. 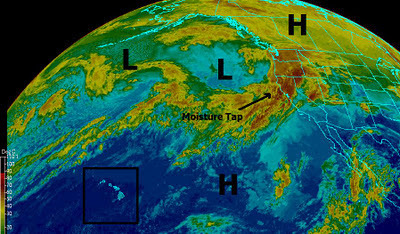 There is now a very adequate moisture tap associated with this storm. The Sierra should pick up 1-3 feet of very skiable powder. The Carson range about 2/3 of that. Here is a forecast for 4:00 Sunday afternoon by the GFS. I am thinking the GFS is a little slow on the storm which may well get going earlier. In any event you can see the moisture tap from the west that is feeding this storm and the NWS has increased their snow totals. 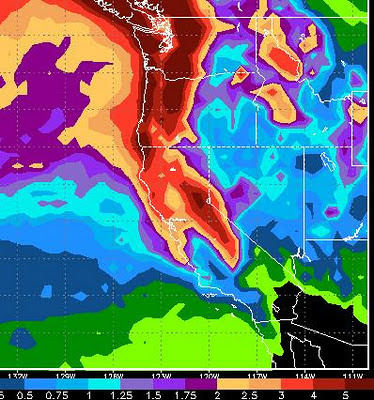 As storm 2 begins to hit the Sierra, it is mixing with some incredibly warm air. This is causing rain below 9,000 feet. However, cold air is on the way and those snow levels should drop to around 7,500 by 8:00 tonight when the really heavy stuff comes in. I am not speaking for any Tahoe resort, but winds should be manageable tomorrow morning when most ski areas open. There should be a blanket of 2-3 feet of very heavy snow. That should make a nice base and allow some additional terrain to open in the coming days. Some of that snow should be groomed down and most will fall between 8:00pm and 3:00am tomorrow morning. See you up there! When the moist air mixed with the dry air, the dry air won. 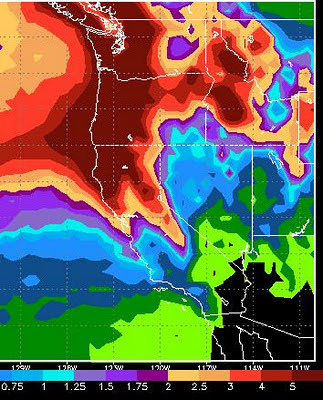 Both the Sierra and Carson range picked up 2-4 inches, which was less than anybody predicted. The Washoe Drive fire appeared to fall victim to wind shifts as the front moved through. Once the wind started pushing the fire back, there was nothing to burn. In any event, moderate to heavy rain tonight will end all chance of fire for now. I am liking what I am seeing in the way of moisture and storm trajectory. I am hoping we are on the higher side of some of the forecasted precip ranges. You can see the line of storms being forced south and into our area by the blocking high pressure ridges. Thursday First wave comes in. Snow levels will be right around 6,500 feet. 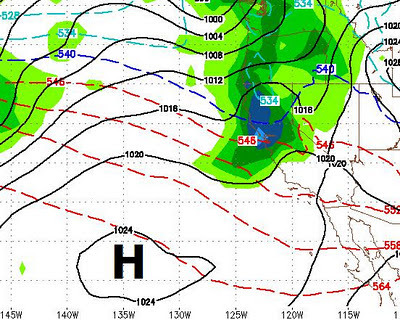 This wave will not have a strong moisture tap. Add that with the incredibly dry air we have right now and precip totals will be down. 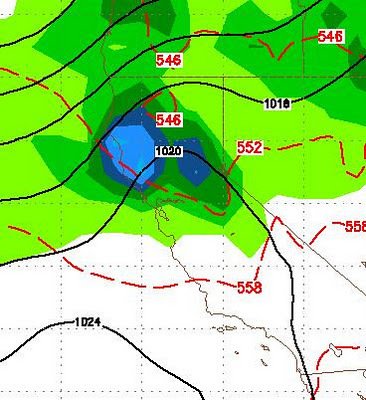 I am guessing the Sierra will get perhaps up to an inch of precip by Friday morning. Because of the cooler air, that should translate to around 6-15 inches of snow for most of the Tahoe Sierra and Carson range. Expect pretty high winds on the eastern range Thursday afternoon and evening - Gusts to 75mph. The good news is that the latest trends actually have 4 storms coming into our area. The trend is that the snow levels should be much lower for the majority of the event than initially thought. The bad news is that we are not looking at quite as much moisture, but overall expect a major snow event for the Sierra. The crest should pick up between 4-8 feet in the next 7 days. Right now the the upper elevations of the Carson Range look to be in that same area. 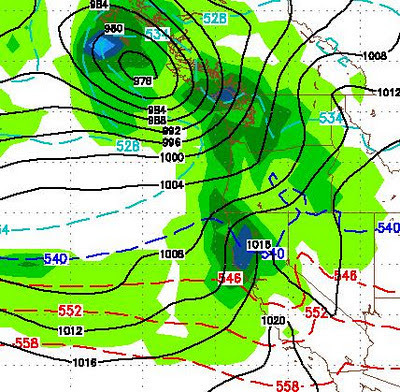 The NWS is looking at a possible Tonopah Low Event. Basically this event is brought on by the weakening of the high pressure which usually prevents storms from spilling over the Sierra. This event has been known to bring very heavy snow to Western NV. The NWS is only considering this as a possibility right now. I will keep an eye on this one. Windy storm that should have snow levels around lake level (6,500 feet). 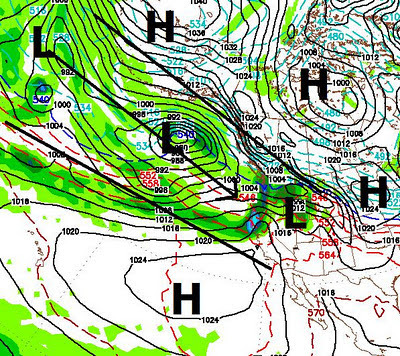 Notice the blocking ridge west of Hudson Bay. That will force storms down the coast. 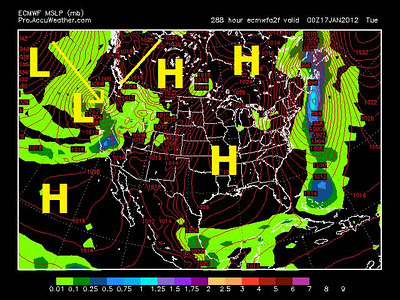 That arctic air will also invade the midwest as it spills out of the north. This will be a very quick post. I have been tracking what looks to be a major change in our weather pattern for the last 2 weeks. However, I have been reluctant to talk a great deal about it, mostly because of the winter, or lack thereof, we are currently experiencing. Checking the latest runs of the weather models, the AO and the PNA, I have noticed that all signs are pointing at winter coming to Tahoe around the the 15th of this month. I am heading up to Mt. Rose to catch the early morning corduroy. This afternoon I will lay out my case for this change coming in about 6-8 days. A Strong area of high pressure is going to move into our area and produce unseasonably warm temperatures and continued dry weather into the foreseeable future. I have checked with a number of weather models and they show no chance of even a passing storm for our area in the next 10+ days. That is the bad news. The good news is that we are finally seeing indications from multiple sources that we are in for a major change between the 12 - 17th of this month. 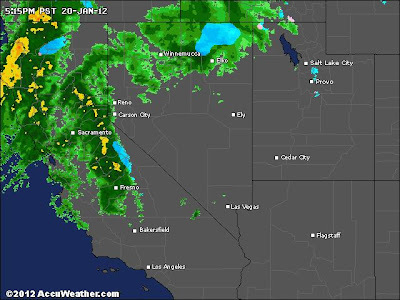 I do not want to jump the gun here, but over the course of the next week I will start to make my case for winter finally coming to Tahoe around the middle of January. This weather has been unprecedented since weather data has been kept.